David Chang talks with Anthony Bourdain. 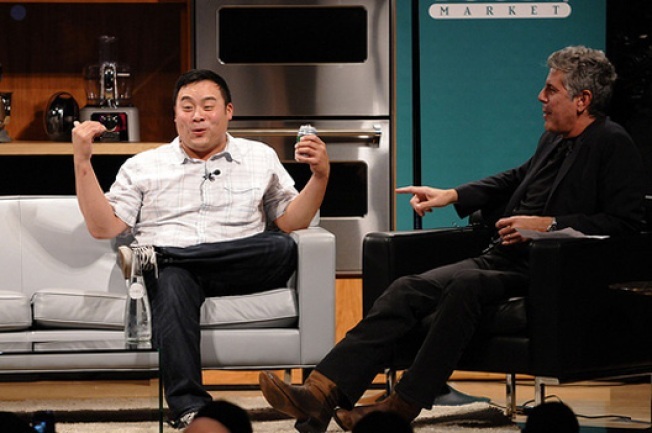 Controversial celebrity chef David Chang was in San Francisco this week to promote his cookbook and to clarify disparaging comments he made about the City. Chang's comments about the City are now infamous. During a panel discussion in New York, Chang called "bulls**t" on San Francisco. "There's only a handful of restaurants that are manipulating food ... f***ing every restaurant in San Francisco is serving figs on a plate with nothing on it." At Wednesday's panel, hosted by 7X7, Chang clarified his comments early and often saying Bay Area chefs—and chefs everywhere for that matter—have grown too content with the status quo, and there needs to be a progressive movement lest things get complacent here, there and everywhere. But in an interview last week, Chang had some different advice for a city, he says, was served his quotes completely out of context. "Why would people get upset?" Weekly. "I'm not gonna retract what I said. I think everybody needs to chill out. People need to smoke more marijuana in San Francisco." Sound advice for a "retardedly stupid" situation. For all those who weren't on the Tim Lincecum bandwagon, Chang told the crowd they could "f***in' kill me outside." No one did.